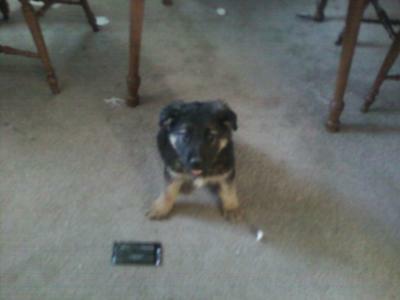 Is my puppy a full blooded German Shepherd? And how old do you think he is? I recently adopted a German shepherd puppy and was told at the shelter that because of the white marking on his chest and his shaggy fur, he's a mix. I've been looking at a lot of pictures of German shepherds, including the past litters my aunt has bred, and he by all accounts looks purebred to me. Well, judging just from the photo you've sent it does like like your puppy may very well be a full blooded German Shepherd puppy. And just because there is white on your puppy does not disqualify it as being a GSD because the white color has been in the breed from the beginning. And concerning the longer cost, there are many, many, many longer coated German shepherds around - often referred to as "coated" so that is no disqualification in and of itself either. So whether your puppy is or isn't a purebred is a bit up in the air since we don't know anything about the parents but concerning the age it looks to be around 9 - 10 weeks old to me - again this is just an estimate. Either way, whether it is or isn't a purebred German Shepherd puppy, you've gotten a beautiful new baby and a wonderful new friend for yourself. Good luck with your new baby and have fun.